Rwigara's family Premier Tobacco Company in Gikondo, Kigali. Rwanda Revenue Authority has raised Rwf1.7 billion ($2 million) in an auction of equipment from the embattled Rwigara family's tobacco factory. The taxman is seeking to recover over Rwf5 billion ($6.9 million) it says it is owed in taxes. 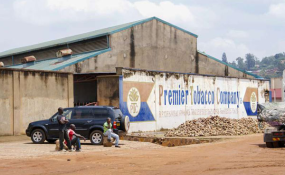 Machinery and equipment at the Premier Tobacco Company were sold off on Monday to MM&RGD, a little-known local company, at the factory premises in Gikondo Industrial Area, Kigali. The sale had been delayed by a week after the family requested to conduct its own asset valuation. Anne Rwigara, the family's representative, told The EastAfrican that they were however not able to do so. "We were not allowed to enter the premises, so we were never able to carry out our own valuation. We were also not given the machines' documents which were seized in July 2017," she said. The auctioneer, Mr Vedaste Habimana, rebuffed the family's claims as "baseless" but declined to provide further information. The Rwigaras claim the machinery was sold below its value. According to MM&RGD representative Olivier Udahemuka, the company faced no counterbids as less than a dozen people were present at the sale. In March, the taxman raised about $600,000 from the auction of the company's stock which Ms Rwigara protested saying it was sold for half the price. The family alleges that their woes with the revenue authority are politically motivated, partly due to the decision by Diane Rwigara, the eldest daughter, to contest for the presidency in the August 2017 vote. They also question the circumstances in which their father, Kigali tycoon Assinapol Rwigara died. Mr Rwigara died in a road accident in 2015 but the family suspects foul play. Diane's bid was unsuccessful after she was disqualified and charged with forgery and inciting insurrection. Her mother, Adeline Rwigara is also facing charges of inciting insurrection and promoting sectarianism. The two have been in jail since September last year. Their trial is set to resume on July 24. Read the original article on East African. Copyright © 2018 The East African. All rights reserved. Distributed by AllAfrica Global Media (allAfrica.com). To contact the copyright holder directly for corrections — or for permission to republish or make other authorized use of this material, click here. Kenya: New Port in Kisumu - Is It (Still) Good Idea? Sudan: Soon We'll Find Out Who is the Real Revolutionary - Bashir Is Gone, but Army? Kenya: The Light Is Green, the Light Is Red, Who Cares, This Is Nairobi, Just Get a Move On, Will You?